Playing on the road against an in-state rival who usually makes things tough on the Gators, Florida was able to take down Florida State in four. It was a dangerous place to be for the Gators, who just a week ago were upset by Northern Arizona, but avoided a similar fate to the Seminoles, who were previously unbeaten at home. 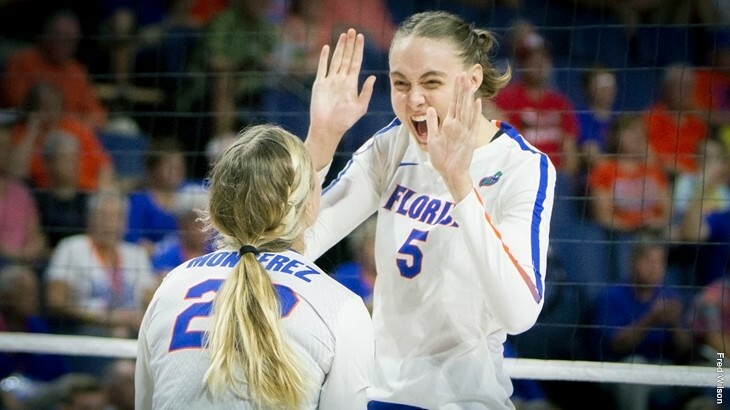 Leading the way for the Gators were their middles. Rachael Kramer (9 kills, .389, 7 blocks) and Taelor Kellum (7 kills, .429, 2 blocks) combined to hit .406 and were critical in Florida out-blocking the opposition 14-8. Despite establishing the middles, passing was inconsistent both ways for the pair of schools. Florida did grit out the win though with a better hitting percentage (.212 to .162) due to their block. Besides that, Florida State had more kills (48-43), assists (41-39), aces (5-3) on less serve errors (4-13) and digs (50-46) – albeit they got a big jolt from their one-sided third set. In other notable performances for Florida, Allie Monserez (19 assists, 11 digs) had the lone double-double of the match. Additionally, Thayer Hall (12 kills, .167, 3 blocks) struggled with errors but led the team in kills while Holly Carlton (9 kills, .200, 5 blocks), Paige Hammons (3 kills, 9 digs) and Allie Gregory (14 digs, 4 assists, 2 aces) were near the top of the totals for Florida. For the Seminoles, Payton Caffrey (14 kills, .163, 8 digs, 4 blocks) and Christina Ambrose (11 kills, .091, 3 blocks) got the heaviest workloads, but were hampered a bit by some out of system passes and sets. Taryn Knuth (8 kills, .188, 4 blocks), Ashley Murray (7 kills, 3 blocks), Brianne Burkert (26 assists, 7 digs) and Kelsey Wicinski (16 digs) contributed as well. Up next, Florida hosts the Gator Invitational with Jacksonville, Florida International and Army. Florida State meanwhile gets another SEC foe in Auburn before heading into ACC play.